The Cuevas de los Tayos is a cavern complex in the Amazon rain forest of Ecuador. Named for the tayos, the oil birds that reside within them, these caves have countless enigmas connected with them, from the discovery of inexplicable architectural details, to claims of curses and treasures, to dangerous encounters with the indigenous people, the Shuar, for whom the caves are sacred. Sharing his more than 30 years of research into the Tayos Caves as well as his own explorations, Alex Chionetti examines the legends and mysteries associated with this site and the explorers who have ventured within. He details the discovery of the Tayos Cave complex by Hungarian explorer Janos Juan Moricz in the 1960s, including Moricz’s claims of finding a metal library with books of gold. Exploring the oral tradition of the Shuar, he explains how this region was the possible origin of Incan culture and the legend of El Dorado. The author shares his own dangerous explorations within the Tayos Caves, and, drawing on unpublished interviews with speleologist Julio Goyén Aguado, he reconstructs the expeditions of the 1960s and ’70s, revealing the Mormon Church’s search for lost tablets, a British army incursion, and sightings of paintings, gold statues and skeletons, copper plates, and a quartz sarcophagus--treasures akin to the Crespi treasure. The author also shares details from Stanley Hall’s suspicious expedition in 1976, which included astronaut Neil Armstrong. Investigating the lost civilizations behind the Tayos treasures, Chionetti explores the possible connections to Atlantis, aliens, Ancient Astronauts, and the Hollow Earth theory; the caves’ links with hermetic societies; and claims of tunnel networks that extend thousands of miles through both American continents, from the Rocky Mountains to Patagonia. Sharing a real-life adventure story wilder than an Indiana Jones plot, the author shows that Earth’s ancient past has many secrets waiting to be uncovered. I couldn’t believe I was going down and that I would be walking through the Tayos Cave. Moricz’s, Goyén’s, and Hall’s cave... A cave that had belonged to the Shuar for centuries. I was going down to the Coangos Cave. As I was going down, the climbing rope made me twirl slightly. I kept going down for what felt like an eternity. It was drizzling, and soil and small rocks fell with the rain, going down with me. It was one of the most exciting experiences of my life, going down to the mother’s womb, the Ecuadorian Pachamama, the sacred interior of the Cathedral Cave of Coangos. On the other end of the first plaza a large hole opened, and we had to go down 23 feet onto a second level, where we would find the almost perfect portal baptized “Von Däniken's Arch.” We descended and I filmed the entrance of Von Däniken’s Arch. From there I concentrated on the tunnel rising to our left and above me, the one with the polished ceiling. The GIR guys went in with me. We passed the Arch into “Stanley Hall’s Gallery,” where we heard thousands of tayos birds cawing. We continued west, under a giant vaulted ceiling. It was the first part of Stanley Hall’s Gallery. As we continued forward I found a dome-like formation of perfectly cut stones. Since I had already seen the photos of the Expedition of ‘69 I was intrigued to see and touch those cyclopean artifacts. The more rational analysts believe they are pieces of rock that detached from the giant vault above us. But there is no evidence that these rocks fell from the ceiling. The rocks seem to have been moved and piled this way on purpose. We continued west for several miles through the cave, until we reached a rocky plaza with sides that curved in a semi-circle or amphitheater. As it bent east, the floor descended, making us slide and run into some bird’s nests made of straw and mud, which seemed to have fallen from above. We were in the stalagmite zone. As we descended to another level we found a smaller room with perfectly polished ceilings and walls, with passageways opening to the left and over the entrance to the second gallery. From there we walked through the monoliths and camped. Here the Shuar guides invited us to a tayo dinner, which they had caught and cooked.
. . . I smelled death in the air, like a fine and cold dagger. I felt the karma and the curse of the Tayos saga on my skin and on my conscience. Maybe my time had come, and I didn't know if I deserved the luck of the previous explorers and researchers on the topic. Or maybe I did, and I would soon meet Moricz, Goyén, Jaramillo, and Andreas, from this side of the diabolical story. A Shuar woman, whose name I won't say to protect her, saved Kleber and then us. We were in a small crowded room. The GIR guys were furious they had listened to me. This is where I found out the Austrian 9 mm guns hadn't been left behind--they still had them. We had to remain quiet, without making a sound or turning on a light. The room had many holes where light was shining through, but I didn't know if this light was from the lightning from the storm or from the torches of the angry Shuar who had a license to kill us. I thought that night would never end. I prayed to Father Crespi. He had been a part of this story, and since he was being sanctified, maybe he could send us some of his peace. Suddenly someone was shooting at our heads. On the other side of the wall the children of our protector started crying when their mother yelled: “They’re coming!” The dogs were barking. The lightning continued, but they weren’t getting any closer. We decided to leave most of the equipment and get to the river to try and cross in the cable car before being detected. Our savior’s plan was that we should leave at five in the morning, because at that time our chasers would still be sleeping off the alcohol they drank the night before. At five o’clock, before the rooster could sing, we were slipping off through a ditch that used to be the drainage of an old path. We couldn't see much, but in fifteen minutes we reached the crossroads. We had help from men, the Shuar woman, her son, and two grandchildren. When we crossed the torrential Zamora, we heard people on our tracks. We disabled the cable car so they couldn't cross. On the other side of the river we found the place where they had planned to ambush us the night before. Dozens of footprints and cartons of cheap wine evidenced the macabre wait. “Run for your life, Alex!” My colleagues repeated over and over. I don’t think I’ve ever ran so fast up a muddy hill. Dawn was rushing upon us. It was half an hour of terrible ascent, with the risk of falling on the sides or of putting a hand on a venomous snake. Breathless, and completely heated up, without even having to drink Ayahuasca, we reached the bridge of the Namangoza Gorge. We feared there would be another ambush on the Yuquianza, but there wasn't. A smiling Lucho, the Shaman, was waiting for us with the other officer from the Coangos. They were there to help us in case of any more trouble. The worst was over. . . .
Alex Chionetti is an award-winning journalist, explorer, and filmmaker. A consulting producer for several seasons of Ancient Aliens, his documentaries have been broadcast on Fox, NBC, A&E, History Channel, and other international networks. The discoverer of two lost cities in the Andean region and a member of the Explorers Club, he lives near New York City. 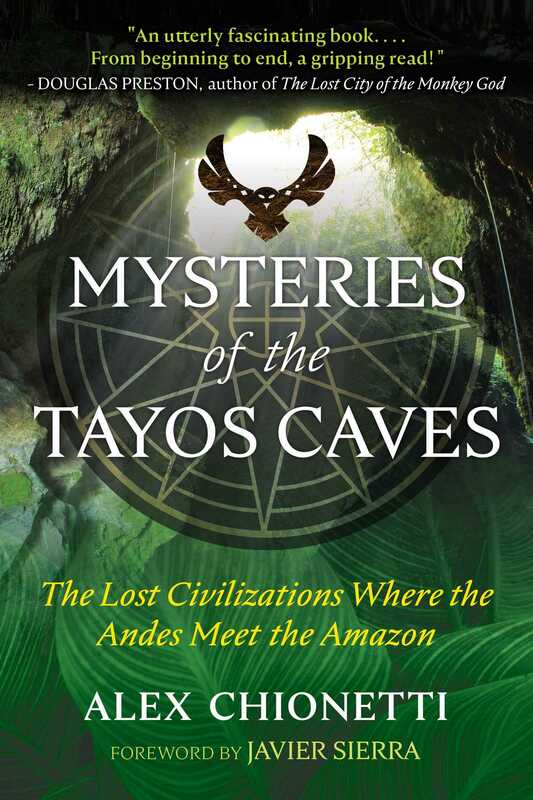 Mysteries of the Tayos Caves by Alex Chionetti is an utterly fascinating book that delves into the amazing history, legends, stories and traditions of the vast Tayos Cave system in the Amazon and the spectacular treasures and earth-shattering secrets said to be hidden there. The book also chronicles the author’s own harrowing exploration of the cave system. From beginning to end, a gripping read!